On Thursday night, less than a month ahead of the midterm election, civil rights groups filed a federal lawsuit seeking to block a Georgia law that suppresses minority votes. The lawsuit alleges that the office of Secretary of State Brian Kemp—the Republican candidate in the state’s gubernatorial election—has employed a voter registration strategy that makes it much harder for voters of color to cast ballots, and makes it likelier that they will be purged from voter rolls. If elected, Democrat Stacey Abrams, Kemp’s opponent, would become America’s first black woman governor. 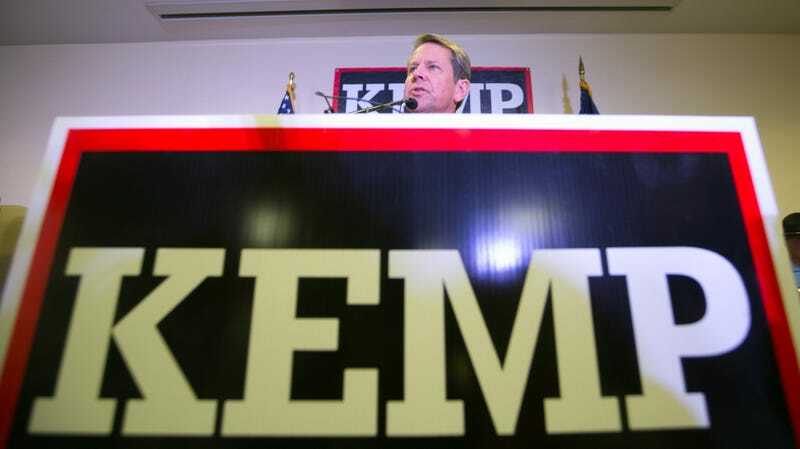 During his tenure as the state’s Chief Election Officer, Kemp created the “exact match” protocol, which requires handwritten voter registration applications to match identification records exactly, without any room for human error (such as a missing hyphen, a typo, a data inputting error, or mistaking an “I” for an “L” for example). Registrations that don’t have an “exact match” fall into pending status, a gray area that could get them turned away from the polls unless they bring ID with them (naturalized citizens, for example, have to bring proof of citizenship with them to the polls). Civil rights groups sued over the “exact match” policy, but in 2017, Georgia turned it into law. Voters are expected to fix any discrepancies within 26 months, else they may risk becoming purged from the voter rolls. In 2008, Wisconsin dropped a similar “no match” protocol after four out of six judges failed. The lawsuit claims that the “exact match” law violates parts of the Voting Rights Act, the National Voter Registration Act, and the First and Fourteenth Amendments of the U.S. Constitution. According to the filing, since July 4, 2018, approximately 80 percent of the “pending” voter registrations were submitted by African-American, Latino and Asian-Americans. White people made up only 9 percent of the failed voter registrations. The system also relies on outdated citizenship data from the Department of Driver Services, which flags naturalized citizens as non-citizens, regardless of offering proof of citizenship. “Because of the errors and limitations inherent in the ‘exact match’ protocol, the 26-month cancellation requirement for ‘pending’ applicants will undoubtedly result in the cancellation of pending applications that are facially complete and accurate before the 2020 Presidential election cycle,” the complaint states. “Unless the Court grants the relief requested herein by Plaintiffs, this protocol will continue to have a discriminatory impact on African-American, Latino and Asian-American applicants and will continue to impose severe burdens on voting-eligible Georgians’ fundamental right to vote that are not justified by any rational or compelling state interest. While the case is ongoing, Danielle Lang, senior voting rights attorney with Campaign Legal Center, one of the co-counsels for a a coalition of civil rights groups bringing forth the suit, wants Georgia voters to know that those on the list can still vote in the upcoming midterm election. “There is a way for these individuals to vote,” she said. “Show up on Nov. 6 in person and vote in person” with a Georgia photo ID (and proof of citizenship, if you’re a naturalized citizen), she advises, “and you’ll be removed from that pending list.” If you vote by mail, Lang advises to send a copy of your photo ID (or voting in person if possible).